New follower and thanks for commenting on my Pita Chip recipe!!! I'd love for you to Follow Me back if you've got the time. 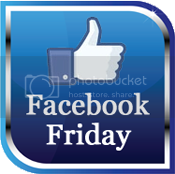 This Facebook Friday thing looks awesome. If you do it again, I'm in!! !